Firstly, going a bit retro, musically. Been thrashing some ‘Stones…..the only place I can find a decent version of ‘Monkey Man’ on the web is here: ignore the crappy preliminary and…post-liminary? ?whatever…ignore the silly pictures, just listen to the track especially when it hits a peak and just soars at 3.00. Just listen to the interplay of Richards’ and Watts’ guitar and drums ….bloody transcendent. Better still, just stick the entire album on. And if you haven’t got a copy of ‘Let It Bleed’ go out and get one now. Make it your Christmas present to yourself. Because you’re worth it. NOWW.. AROUND THE BLOGS… Cactus Kate has some advice for press gallery types looking at jumping to the dark side…its a little late now, for some. As is usual with anything monetary she is bang on.. .comes to similar conclusions I came to some time ago. Meanwhile, voters at Public Address have voted ‘Credit Crunch’ as word/term of the year. Amen to that…my fear was it would be ‘infrastructure’ which i”m getting fed up with having to write. Infrastructure has become the bloody cure for the recession, the credit crunch and bloody everything, not just here abut around the world. I expect to see Jude Dobson touting it on that health spot thing she does on the teev. I bet it cures thrush. The lads at NZBC are recruiting after one of them went ducked outside after announcing he might be gone for some time. And I’m off for the year. Still doing a bit of work but also enjoying the sun. 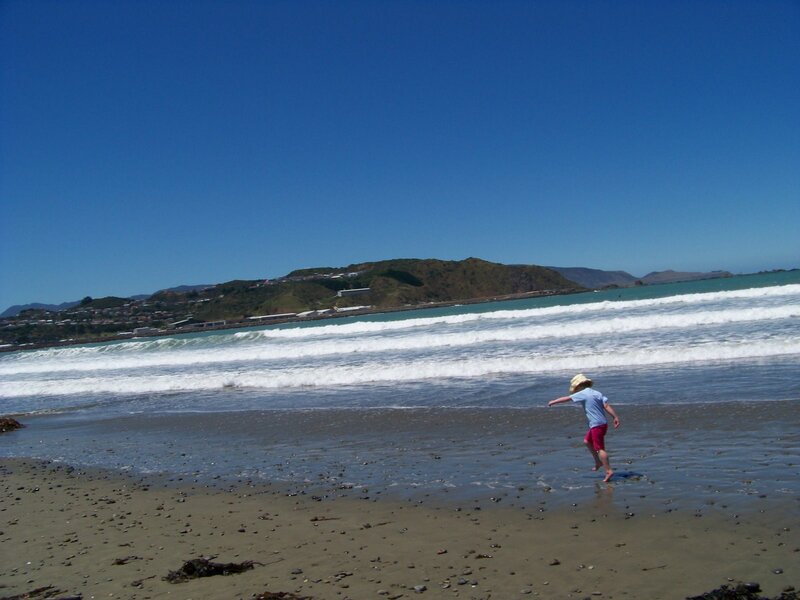 Took the wee miss to Lyall Bay this morning…she loved it. After tomorrow: Family Christmas things, a few odd jobs around the house, then off to the hills in mid-Jan.